The first step of this recipe is to soft boil your eggs. You may want to make a dozen in case to have some backups in case you break the yolks in a couple of them. Bring a pot of water to a rapid boil and then reduce the heat to a rolling boil. Put up to 4 (cold) eggs in the water carefully and cook them for 6 minutes. Once the 6 minutes are up, carefully remove the eggs and rinse them in cold water immediately (for about 60 seconds). Repeat this process until all your eggs are soft boiled. Once your eggs have cooled (from being run under the cold water), carefully remove the shells. This part requires some patience. Put all the eggs in the freezer for about 2 hours (until they are completely frozen through). While the eggs are freezing, make the muffin batter. Combine the flour, cornmeal, sugar, baking powder, black pepper, cayenne, salt and baking soda in a large bowl. In a smaller bowl, combine the chives, yogurt and butter. Add the wet ingredients to the dry ingredients and combine. Finally add the cheese, ham, and red peppers. Once the eggs are completely frozen, preheat the oven to 425 (we need these muffins to cook quickly so that the eggs in the center don’t overcook). Add the batter to the muffin tin- filling each hole only about halfway. 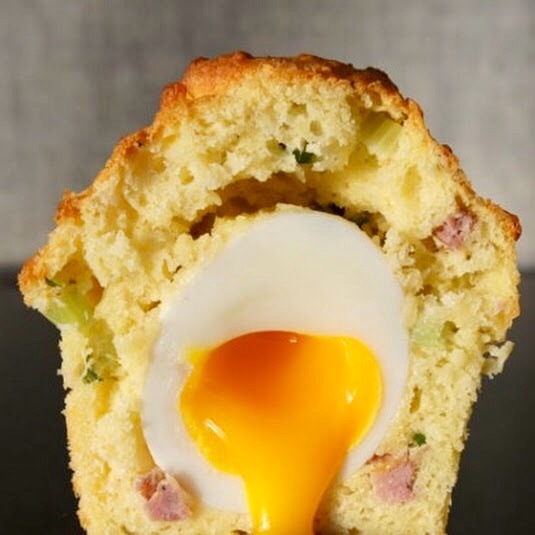 Add a frozen egg into each muffin and then cover them with the rest of the batter. Bake for 20 minutes or until the muffins are brown on top. This part also requires trust because you can’t stick the muffins with a toothpick to see if they are done. Remove the muffins from the tin immediately after they come out of the oven (so they stop cooking). Note: These muffins are best served warm but are also delicious cold. To reheat the muffins, you can microwave them for about 30 seconds. These muffins will keep really well for a few days in the fridge.